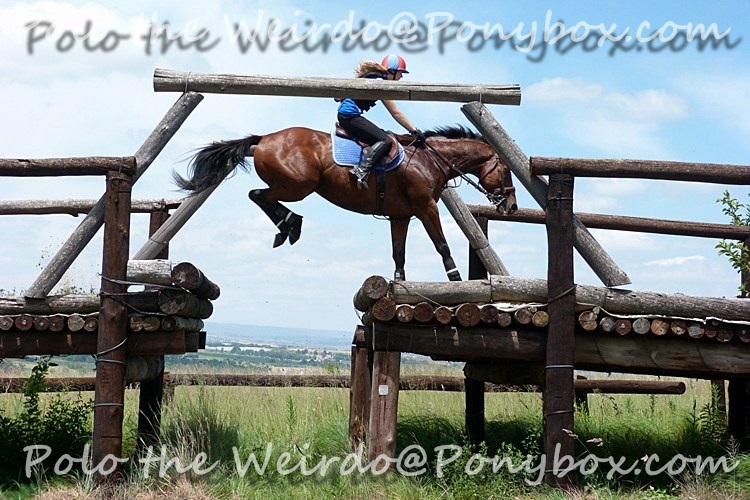 My instructor was around to help me with Moony, and we started by doing a bit of free jumping. 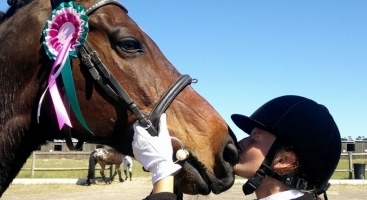 She got him going extremely well, and he soon learned to jump on his own, without the help of a rider. As Moony is uncertain in our jumping ring, we simply jumped him in the round ring where he is currently being kept when not closely supervised (To keep him safe from the other horses.). Since he was jumping on a circle, we kept the jumps low and simple. 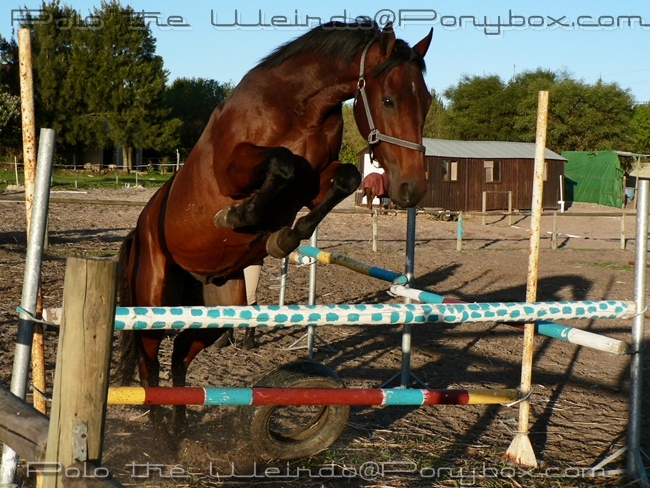 We started with a couple of trotting poles, letting him get the hang of using his body, then gradually raised the jump until it was around 60cm or so, and then he started actually jumping it. He couldn’t quite understand how to jump out of a stride, so would hesitate and then throw an awkward jump over it, but he definitely started to understand toward the end. After the short free jumping session, we tacked him up and my instructor got on to ride him. 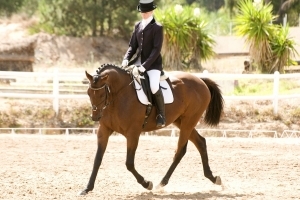 She worked on his bend and tried to get him to accept the contact in walk and trot. At first he resisted, but after a while he started to soften for a few strides, then put his head up, then soften again and so on. She did lots of serpentines with him to try to get him bending and listening to leg aids. Moony soon started getting the hang of it, and began to attempt to come into a frame more readily. 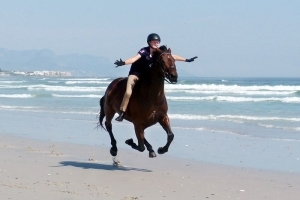 When she was done, we swapped horses and I got up on Moony. I tried to do what she was doing, and at first Moony resisted me, but then I started using more leg, and he began to soften. It turns out that Moony works extremely well with spurs, and as I happened to be wearing some I was able to get him working well off my leg. After a few circles, he began going quite well for me, softening and then raising his head again just as he had done with my instructor, though still not bending quite as well. After working on this for a while, I decided to see if I could get his left canter lead. In most of our attempts we failed, but I did notice something interesting: Whenever I asked for the canter, he would come into a frame for that brief moment. As I use my aids mostly unconsciously at this stage, I realized that whatever I was doing when asking for canter must be what I need to do to ask him to come into a frame, so I concentrated harder on what I was doing next time I asked him. 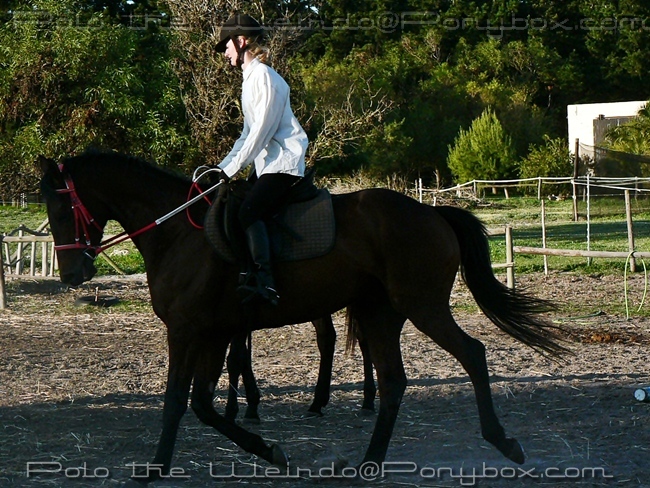 As before, he came into a frame just as he was about to canter, so I half halted him and kept him at trot. He kept his frame for a few strides before putting his head up again. After that, I started to understand what I needed to do. 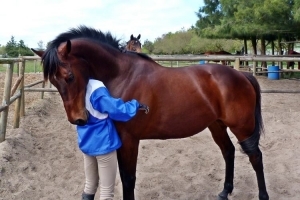 I went into a sitting trot, and used a lot of leg, nudging him with my inside spur quite often. I kept very soft hands, opened my inside hand, and tried to ride him from my legs into my hands. Like magic, Moony bent to the inside and came onto the bit! 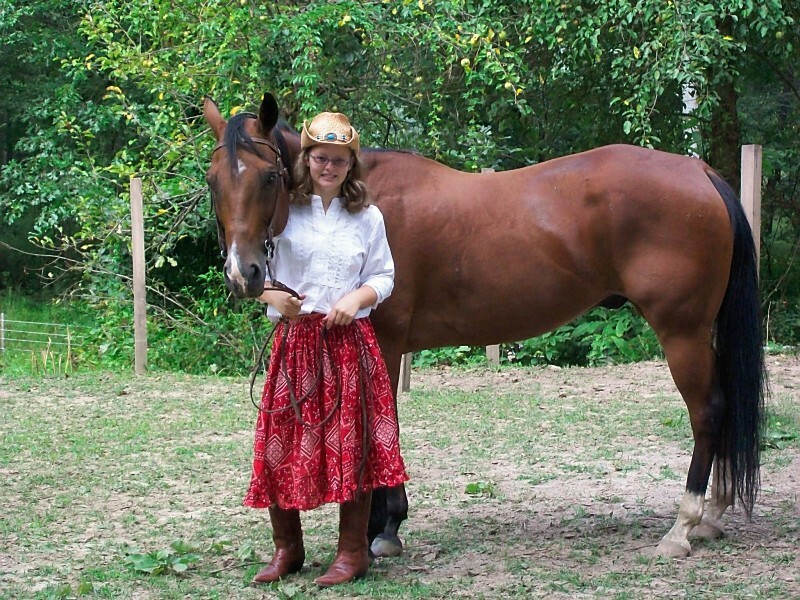 I rode him around a while longer, and he became softer and softer in my hands, until I did not have to ask him at all, and he just dropped his head automatically. 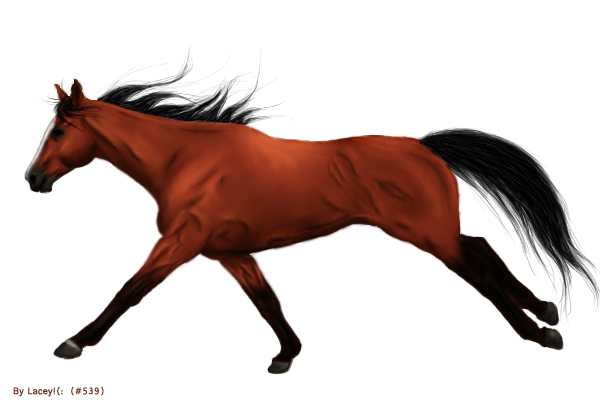 I worked on a few transitions, and found that he would go smoothly from walk to trot, and trot to walk without losing his frame. Once I was satisfied, I started working him on the right rein. Again, he came into a frame and again he transitioned beautifully, this time in canter as well, but on the right rein he could not understand the concept of bending to the inside. 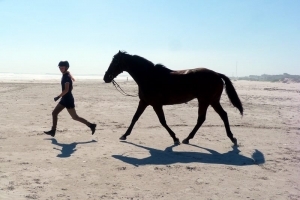 I worked on it for a little while, but soon came to the conclusion that I’d be better off letting him learn it on the lunge first, so I decided to try something else. I started introducing collecting and lengthening. Moony responded very well, and kept his frame while I adjusted his stride. At the end, I did a couple of walk-to-canters and canter-to-walks, then put him away. I was extremely pleased with this session, as I felt it was our first major breakthrough! I started by loosening Moony up for 10 minutes, before spending a brief 5 or 10 minutes going over the schooling Moony had learned the previous day. 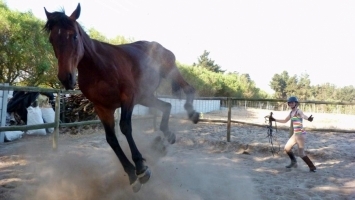 He remembered it perfectly, and was soon working very nicely, but I did not want to do to much of the same thing, for fear he would become bored, so I decided to work on a bit of jumping instead. I set up 3 tiny pops with trotting poles leading into them. At first, Moony was confused and would trot in over the first one, then turn out. The next time I brought him in, he went all the way through, but knocked the second and third jumps, and only jumped from a trot – not actually popping through. The third time he did it perfectly! 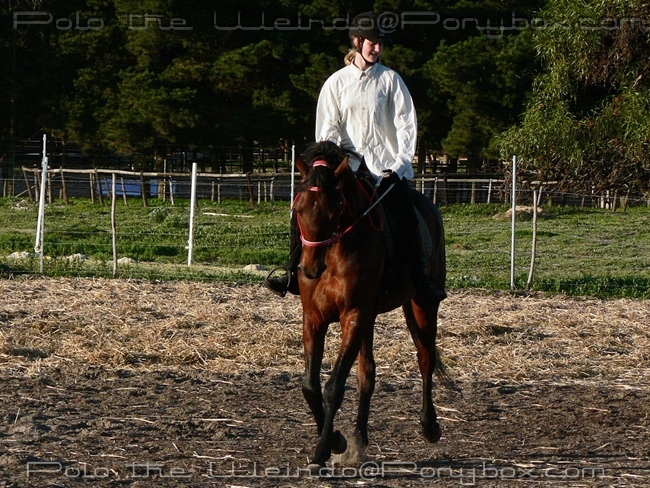 Then I took the trotting poles away, adjusted the distances, and brought him over from a canter. This he understood much better, and bounced merrily through without any errors. I started working on introducing his schooling into his jumping, trying to get him bending and in a frame, developing a powerful canter before heading at the jump. Once he understood the pops well enough, we set up a low 1-stride combination. He struggled to place himself for the first jump, but after jumping in he strided out and jumped the other obstacle nicely. After working over it a few more times, Moony was able to jump it comfortably. That concluded our session. My instructor came around again, this time to give me a brief lesson on Moony. While I was waiting for her, I free jumped him in the round ring, and was pleased to see that he understood much better, and was able to jump more accurately and with less encouragement. When my instructor arrived, we tacked Moony up and gave him a light schooling session. After loosening him, I did some serpentines and circles to try get him bending, then we worked him into a frame in trot before doing some trot serpentines with transitions over the center line. Once he was working nicely, we worked on his left canter lead for a short space of time. He got it once or twice, and once or twice more he would get the wrong lead, then change to the right lead without being asked. He was starting to understand the concept better, but again, we did not want to press the issue by over-training it until he had got it on the lunge. After schooling him, we set up some trotting poles. I rode him over on a loose rein so that he could start to understand his own body, and work out how and when to lift his feet. Once he was doing it well, we set up a little cross at the end, and did the trotting poles into the cross. Moony jumped it very nicely, and even landed on the left lead a few times afterwards! He even jumped clear over the little cross the one time he stumbled on approach, and I was extremely pleased with how he was willing to right himself and still go over without being deterred by the trip. I spent some quality time with Moony, just talking to him and petting him, then let him hop over a few tiny free jumps, just to keep him in the zone. Overall, it was just a little session of giving him some attention and letting him enjoy himself. After that, we let him out to join the herd, and let them all have a mini-stampede, something that they always thoroughly enjoy! It’s amazing to watch them run around and play, and just enjoy being horses the natural way. Moony was hesitant at first, not quite understanding the ‘wild horse’ vibe that my band of loons were giving off, but after a while he became more daring and started to run and buck and frolic with them. He was really enjoying himself by the end of it, and seemed most disappointed when the other horses decided to stop. We took the free jumping to a new level. I started off with some nice low jumps in his round pen, and finally Moony clicked! He started jumping them off a stride without hesitating first! That was the sign I had been waiting for. I raised them a little higher than usual, and Moony hopped over comfortably, again without breaking stride! 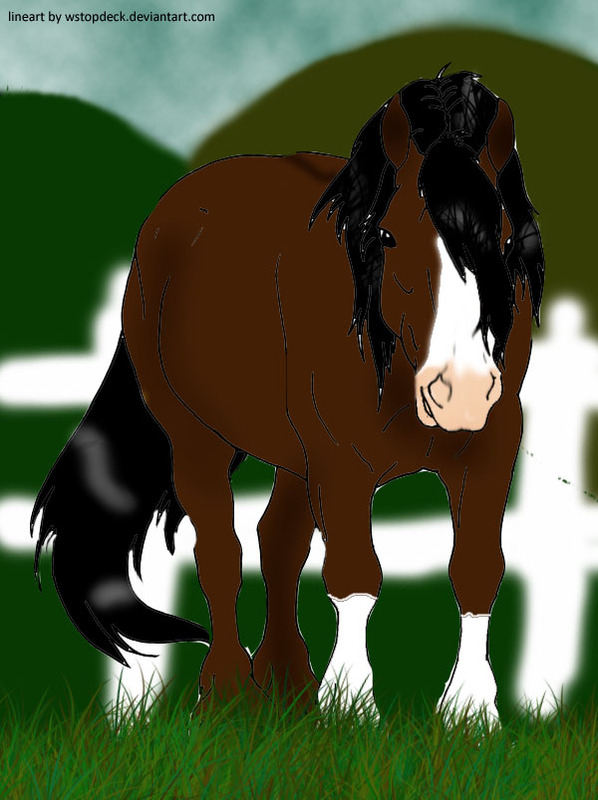 The next thing I decided to try was making something spooky, so I grabbed some horse blankets, a rain jacket and an old feed sack and attempted to turn the jump into an evil horse-eating monster. No success. Moony hopped over it without even bothering to look. Since he was going so well, I decided it was time to try him in the jumping ring again, so I built a funnel into a low upright, lead him to the start of it, then let him go and cracked the whip. He hopped sweetly over, then trotted into the corner and stood there, looking rather confused. We repeated this a few times until he eventually learned to trot around the whole arena with me following nearby with the whip, and go back into the corner, through the funnel, and over the little jump on his own. 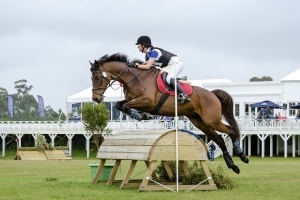 As I had predicted, he found it far easier to jump on the straight, and he found everything extremely easy and very fun, and gave me lovely, springy jumps and nice bascule. My favorite part of the session was when he went into ‘his corner’ and when I cracked the whip to chase him around again, he wheeled around and headed off in the opposite direction, then jumped the fence backwards, going into the funnel, all on his own! He absolutely loved the jumping! Once he was going well, I decided to try some bigger, more challenging fences with him. He jumped them well, and I was extremely pleased with him by the time I put him back, though I think he was even more pleased with himself! He was prancing around like he owned the place! Wow! 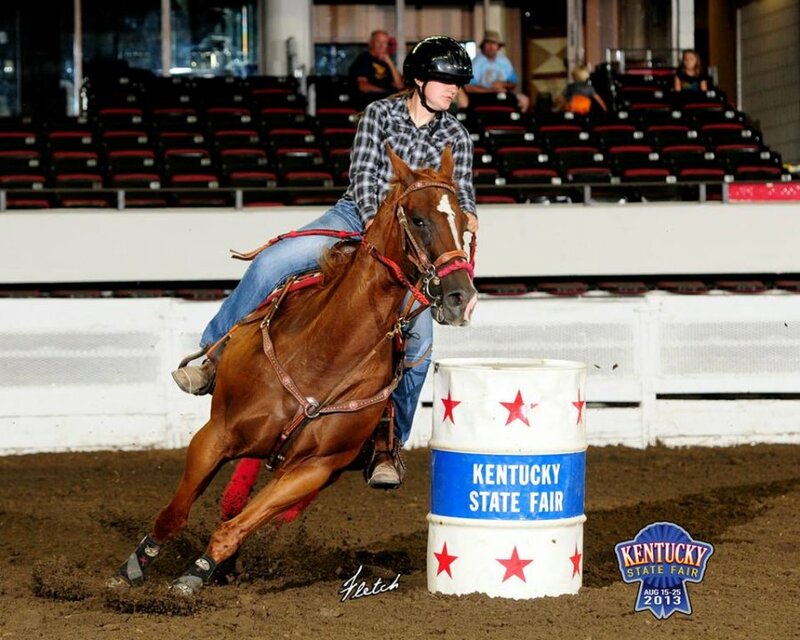 he looks like he loves jumping, heck, he might love it more then racing...lol, good job. WOW!! What a lovely tuck he has in his front legs! He is pretty calm and gentle, but he had very ticklish skin, so unless you use a very soft brush and soft strokes, he tends to get a bit fidgety. Shame, I can't blame him... I don't like the way they groom them at the racing stables. I saw the groom using a hard bristled brush and hard strokes on Moony's clipped coat... Poor little guy was almost trying to kick the stable down! He's always been fine with me though, bless him. He's such an honest creature. Hehe! Thank you! :P He is a rather siny fellow. :) My superstar! Haha! ImaCoolCowgirl: Mwahahaha! He does, yes? 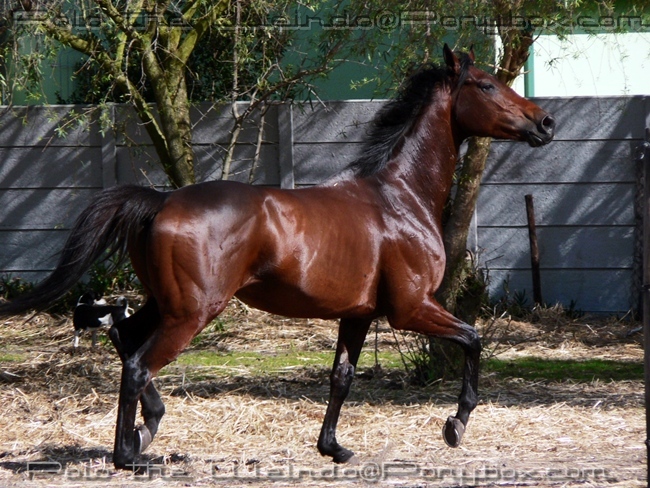 :D I cannot wait to get him into a show ring and turn heads. :P Hehe! it's nice to see Moonfire's training going so well, he is a beautiful horse! Moonie's gorgeous. That third photo is calendar worthy. Aaaw, thank you! That is so sweet! ^_^ If only the background looked better... :P Haha! Thats a shame about how he was groomed in the racing stables! But he must really trust you to stay calm when you groom him after that groom!